Fiber optic cables are composed of one or more transparent fibers enclosed in protective coverings and strength members. Fiber optic cables allow signals, such as light, to travel through without interference. A real fiber optic cable is made of glass which is incredibly pure to allow light to pass through over very long distances. The glass is then coated in two layers of plastic. The plastic gives the equivalent mirror effect which creates total internal reflection. Light traveling through the fiber bounces at shallow angles and stays completely within the fiber. This happens when the light hits the interface at angle larger than the critical angle. At this angle it will not pass through to the second medium at all. If the angle of incidence is larger than the critical angle, Snell's law will not be able to be solved for the angle of refraction, because it will show that the refracted angle has a sine larger than 1, which is not possible. Fiber optic cables play a very important role in long distance communication such as telephone and Internet lines. These cables are significantly less expensive than copper wires. Simplex- Simplex cables are fiber optic cables with a single optical fiber. They are used in applications that only require one-way data transfer. Simplex is available in singlemode and multimode. Duplex- Duplex cables are fiber optic cables with two optical fibers. They are usually set up side-by-side and can be used for applications that require simultaneous, bi-directional data transfer. 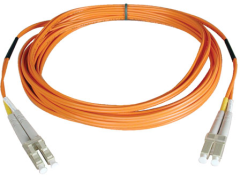 Duplex fiber is available in singlemode and multimode. Multifiber- Multifiber cable is a fiber optic cable with several optical fibers. Patch cord - Patch cords are short lengths of fiber optic cable with connectors that can be directly attached to other equipment for connecting and managing convenience. Bare fiber - Bare fiber refers to a fiber optic core and cladding only. This fiber is primarily used for connecting equipment on one end to a light source on the other. Bare fiber can be terminated, polished, or prepared for pig-tailing. Fiber types can be singlemode or multimode. Modes describe the distribution of light energy across the fiber. Light rays can travel through the wire as long as they hit the core-cladding interface at an angle less than that of the critical angle. Singlemode describes a fiber with a small core that only allows one mode of light to propagate. Modes define the way that the wave travels through space. Singlemode fibers have the same mode but different frequencies. This means that they are distributed in space in the same way to give a single ray of light. Singlemode is also called transverse mode since, although the light is running parallel with the fiber, the electromagnetic vibrations occur perpendicular (transverse) to the length of the fiber. The size of the core is only a few times the wavelength of light transmitted. It is commonly used with laser sources for high speed, long distance links. Multimode describes a fiber with a core diameter much larger than the wavelength of light transmitted. This allows many modes of light to propagate through the fiber. It also gives multi-mode fiber a higher "light-gathering" capacity than singlemode fiber. Each mode, or ray, is transmitted at a slightly different frequency, which means that the channels can be split and multiple signals can be sent at the same time. The larger core size simplifies connections and allows the use of lower-cost electronics such as light-emitting diodes. Commonly used with LED sources for lower speed, short distance links, such as within a building or on a campus. Modes can also be characterized by numbers. Singlemode fibers are assigned the number 0, which is the lowest-order mode. Multimode fibers carry higher-order modes. This number depends on the fiber's numerical aperture (discussed below) as well as on its core diameter and the wavelength of the light. Low bandwidth, which limits the data rate the device, can carry to about 200Mbit/s for a 50 m link. Often referred to as PCS, it has a glass (silica) core and plastic cladding. Used for research, medical, material processing, etc. Large diameter core with high dispersion characteristics. The cable is designed for the LAN environment and light is typically generated with a LED (light-emitting diode). Multiple layers of glass that contain dispersions enough to provide increases in cable distances. A graded index cable has optical fiber in which the refractive index of the core is in the form of a parabolic curve, decreasing toward the cladding. Common connector types for fiber optic cable include biconic, D4, ESCON, FC, FDDI, LC, loopback, MTP, MT-RJ, MU, SC, SMA, and ST. Some fiber optic cable comes without connectors. More information on fiber optic connectors is available on the Fiber Optic Connectors Specification Guide. Fiber optic cables have many important applications. They are used by telecommunication companies to transmit telephone signals, Internet communication, and cable television signals. Fiber optic cables are typically used for long distance communication applications where they can be used to their full transmission capacity and offset the cost of installation and maintenance. Optical fiber cable is best suited for systems requiring a higher bandwidth since there is an exceptionally low loss. The advantages of using fiber optic cable include its resistance to electromagnetic interference (EMI) because it doesn't use electricity. It is also able to support high data transmission rates. Disadvantages of fiber optic cable include the cost and that it is more difficult to work with than other communication cable. The glass or plastic core make it more fragile and less flexible, and require special training for installation and connector adaptation. There are three components to fiber optic cable: core, cladding, and buffer coating. The core is the inner part of the fiber. It guides the light and has a higher refractive index than that of the cladding which surrounds the core. This is so the light in the core hits the boundary with the cladding at an angle shallower than the critical angle and will be reflected back into the core by total internal reflection. The core is made from a transparent glass or plastic. A "dopant" is added to the core to make it less pure than the cladding. This imperfection helps keep the light within the core so that the fiber optic cable can bend around corners and extend over distances of up to 100 miles. Fiber cable is as thin as a human hair. Fiber core size is the size of the light-conducting central portion of an optical fiber, composed of material with a higher index of refraction than the cladding. The cladding is a glass sheath that surrounds the core. The core size is smaller for singlemode and larger for multimode fibers. The most common fiber types are 1550nm singlemode fibers and 850nm or 1300nm multimode fibers. The core diameter ranges from 8 to 62.5μm, while the most common cladding diameter is 125μm. Cable specifications list the core and cladding diameters as fractional numbers. For example a 62.5/125 micron multimode fiber optic cable means that the core is 62.5 microns and the core with the surrounding cladding is a total of 125 microns. The buffer coating, or jacket, fits over the core and cladding to protect the cable from the environment. The diameter ranges from 250μm to 900μm. It provides mechanical protection while allowing for flexibility in the fiber. The buffer coating is usually made of a soft or hard plastic such as acrylic or nylon. Kevlar is a popular choice for the jacket material. It is strong and used to bundle and protect the loose tubes or fibers in the cable. Kevlar protects the fibers when the tension is placed on the cable. The color of this jacket typically depends on the type of fiber, singlemode fibers typically wear a yellow jacket and multi-mode fibers wear an orange jacket. Cables used for outside applications have black jackets. To learn more about optical fiber, read How to Select Specialty Optical Fiber. Cable performance specifications to consider when searching for fiber optic cable include wavelength, numerical aperture, maximum attenuation, and bending radius. The wavelength refers to the wavelength that the cable was designed for. Maximum attenuation is the decrease in signal strength along a fiber optic waveguide caused by absorption and scattering. Attenuation is usually expressed in dB/km. Bending radius is the smallest radius an optical fiber or fiber cable can bend before increased attenuation or breakage occurs. Common features for fiber optic cable include polarization maintaining, graded index, and metallized. A polarization maintaining cable has fiber that maintains the polarization of light that enters it. Metallized fibers are coated with metals for increased temperature resistance, soldering, and harsh environments. An important environmental parameter to consider is the operating temperature. Installation of fiber optic cable should be done by qualified technicians. Fiber optic cable can easily become kinked or broken, causing dropouts or a complete loss of signal. The proper equipment should always be used. Once the fiber optic cables are installed, it is important to clean and maintain the cables. There are two types of fiber optic connector applications that need to be cleaned: free connectors on a fiber optic patch cable or fiber pig-tail, and connectors plugged in patch panels or other hardware devices and equipment. Wet cleaning: Optic cleaning with a solvent, typically isopropyl alcohol. It is important to ensure that all of the solvent is removed. Non-Abrasive cleaning: Cleaning without abrasive material touching the fiber optic connector end face. This includes air dusters or pressured solvent jet used in automated in-situ connector cleaners. Abrasive cleaning: This includes lint-free wipes, reel based fiber connector cleaners and optic cleaning swabs. These wipes should never be reused. When cleaning fiber optic cleaners, there are three critical steps of fiber optic connector cleaning: inspection, cleaning, and re-inspection. It is important to never touch the end face of an optical fiber connector and to always install dust caps on unplugged fiber connectors. Unused dust caps should be stored in sealed bags. ARINC 802 -- Performance requirements for fiber optic cables used on commercial aircraft. How does a fiber optic cable work? Why do we need fiber optic cleaning? Specialty optical fiber is modified, usually by doping, for a specialized function. It consists of one or more transparent fibers enclosed in a protective covering.